Burlington, Ont. 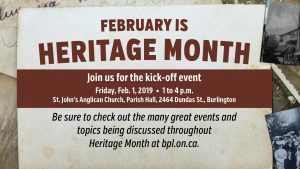 — Jan. 18, 2019 — The City of Burlington’s Heritage Committee has been busy planning another exciting Heritage Month, beginning Feb. 1. Residents are invited to learn more about the events and issues that have shaped Burlington and Canada by attending the informative sessions planned throughout the month. 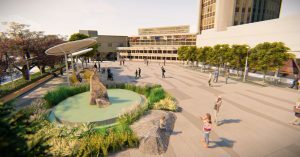 Topics and events will include Black history, First Nations, Freeman Station, Burlington architecture, movies, panel discussions, stories and more. The full calendar listing is at bpl.on.ca and burlington.ca/calendar. 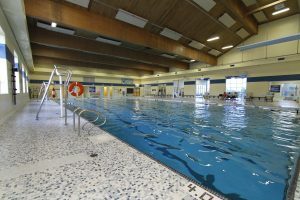 A kick-off event is planned for Friday, Feb. 1. Seating for this event is limited, so please RSVP to arabellagore@gmail.com by Jan. 25, 2019. 2:30 p.m. — Refreshments (hot cider and freshly baked scones) and tours of Ireland House Museum. Burlington is one of Canada’s best and most livable cities, a place where people, nature and business thrive. Sign up to learn more about Burlington at burlington.ca/enews and download the free City of Burlington app.